The ferry ride from Nelson to Donovans is wonderful and the wetlands in Piccaninnie Ponds are a birdwatcher’s delight. 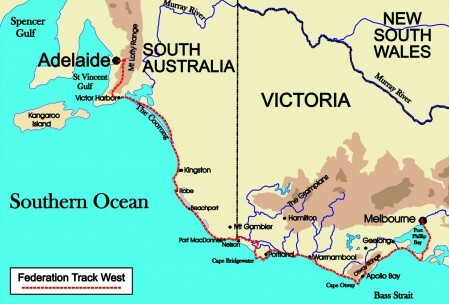 At the western end of the Park the Federation Track runs onto a typical Limestone Coast beach. This wide, flat beach makes for fast walking to a cycle path that runs through Port MacDonnell to Cape Northumberland with its lighthouse ruins, wind-carved crags and outstanding views. The Federation Track then follows fishermen’s tracks and roads to Douglas Point and beautiful Jones Bay. However, the wide, flat beaches soon reappear broken only by the suburban seaside hamlets of Nene and Blackfellows Caves. 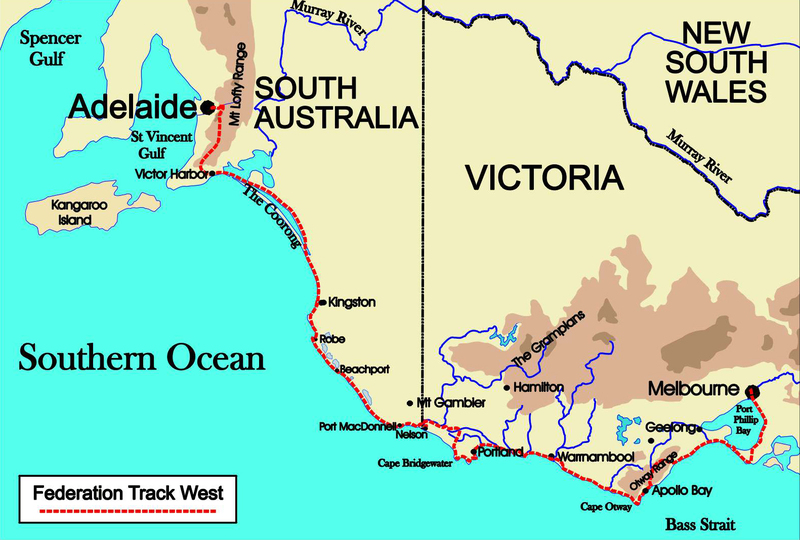 Cape Banks is another prominent limestone headland with great views along the coast and at Cape Banks lighthouse the immense curve of Admella Dunes contrast with the deep blue of the Southern Ocean and the rows of white-foamed reefs offshore. More 4WD tracks and back roads are followed to Geltwood Beach where the Track rejoins the beach but the scenery changes constantly as sea mist distorts rock stacks into headlands and headlands into low cliffs. At Canunda Rock the Track leaves the beach to follow a 4WD track past a series of natural lookouts swinging inland through the dunes to Boozy Gully where it links up with the Seaview Hike. At every turn and twist in this path there is a different view of surf-sculpted cliffs, wind-tortured pinnacles and golden dunes all the way to Cape Buffon. Here the track swings around the headland to provide a spectacular view of Rivoli Bay and the surf-capped reefs that run across this wide blue gulf. At Southend, Burdon Beach is a long but easy beach walk to Beachport with its jade-green ocean, white surf, golden beaches and historic buildings. After leaving Beachport the Track snakes over the ridge behind Cape Martin to a series of sensational seascapes. Every twist in the road brings a new panorama of sea-sculpted headlands and golden beaches. At Wooley Rock it drops down to a series of long, curved beaches running to small limestone headlands. Around every headland a new vista unfolds until it reaches Nora Creina, an idiosyncratic shack community. Beyond Nora Creina, the views from Cape Rabelais are unforgettable and at Errington Hole, the Coastal Track winds through the scrub to repeatedly drop down to more golden beach gems along the coast to Robe Lighthouse. Here a scenic footpad runs around to the Obelisk with stunning seascapes in every direction. The huge swells across South Reef are a wonderful introduction to aquamarine Guichen Bay fringed by the golden arc of Long Beach and historic Robe nestling behind the headland.